Below are some highlights of the life of shree Changra Shekhar ji. Shree Chandra Shekhar, born on July 1 1927 came from a farmer’s family in the Ibrahimpatti village, Ballia district of Uttar Pradesh. By the time shree Chandra Shekhar ji received his Master’s degree in political science from Allahabad University in 1951, he had developed an interest in politics. He joined the socialist movement and was elected secretary of the district Praja Socialist Party (PSP), Ballia. Within a year, he was elected joint secretary of the PSP’s State unit in Uttar Pradesh. In 1955-56, he took over as general secretary of the party in the State. His career as a parliamentarian began with his election to the Rajya Sabha from Uttar Pradesh in 1962. He joined the India National Congress in January 1965. He was soon elected general secretary of the Congress Party in Parliament, in 1967. As an MP, he made a mark by his dedication and determination in championing causes aimed at the upliftment of downtrodden communities, and his commitment to rapid socio-economic change in India. He came in direct confrontation with the centres of economic power when he mounted a determined attack on the disproportionate growth of monopoly houses under State patronage. He came to be known as “Young Turk” within the Congress because of the courage of his convictions and his campaign against vested interests. To carry forward his aims and ideals, he founded and edited the weekly “Young Indian” in 1969 from New Delhi. His editorials in the Young Indian were widely and frequent quoted, but the weekly had to be closed down after the imposition of the Emergency and pre-censorship in June 1975. In politics, Chandra Shekhar always was opposed to the politics of power and personalities; he preferred the politics of ideology as the best instrument for socio-economic change. His advocacy of the politics of ideology and his persistent campaign for rapid social changes brought him in confrontation with Indira Gandhi who believed in the politics of personalities and power. Therefore, when Chandra Shekhar proposed that Indira Gandhi should hold a dialogue with Jaya Prakash Narayan (JP) and seek conciliation instead of confrontation, she saw in him the main focal point of dissent within the party. When Emergency was proclaimed in June 1975, Chandra Shekhar was arrested under the National Security Act and detained in solitary confinement for the entire period of the Emergency till January 1977. He was at that time a member of the central election committee and working committee of the Indian National Congress. He played a major role in uniting a number of opposition political parties to enable them to give a combined challenge to the Congress in the sixth Lok Sabha elections. He became President of the newly-united party, the Janta Party, on May 1, 1977, and was continuously re-elected to the post till he stepped down on April 30, 1988. Chandra Shekhar undertook a journey on foot (Pada Yatra, which came to be known as Bharat Yatra) from Kanyakumari in South India to Raj Ghat in New Delhi, covering a distance of 4260 kilometres between January 6, 1983 to June 25, 1983. The Bharat Yatra was aimed at getting closer to the people for understanding their problems and for rekindling hopes in them of the elimination of social inequalities and disparities. The exercise testified to his innate commitment to the politics of commitment and ideology and his aversion to positions of power. 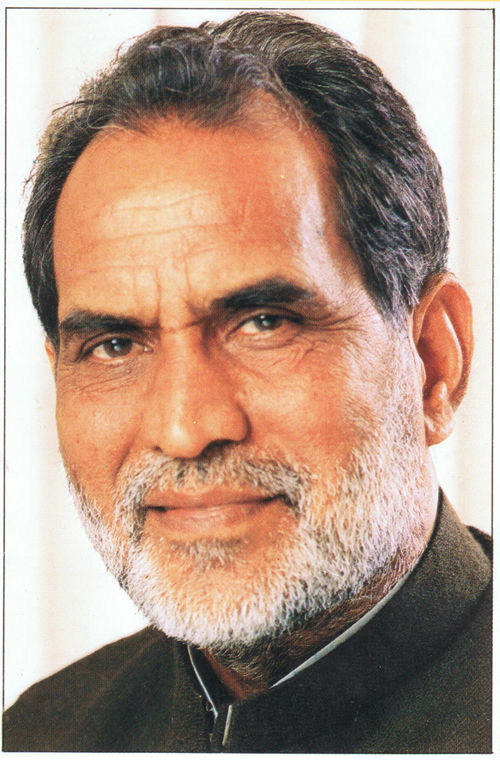 Chandra Shekhar frequently differed with other leaders in the opposition in respect of the methodology of agitation and social change. He felt that unity without an understanding on basic and minimum programmes would prove a mirage. Others, obsessed with immediate gains, were anxious to take short cuts to power. Chandra Shekhar kept advocating adherence to due political processes despite his motives being misunderstood. After the defeat of the Congress (I), in 1989, he refused to join the government and publicly expressed reservations against the leadership. The country was soon pushed into a communal conflagration and eruption of casteist violence. Chandra Shekhar’s view that power without commitment to principles and a minimum agreed programme would be ephemeral. At a period of great political turmoil and uncertainty following the collapse of the National Front government in November 1990, Chandra Shekhar decided to accept the challenge of normalising the troubled polity and putting democracy back on the rails. He assumed power — he was sworn in as Prime Minister on November 10, 1990 — even though aware that his political adversaries and critics would question his motives. But he soon won the hearts of the people of lndia who saw in him a leader with a clear vision, commitment to social welfare and progress, and sincerity of purpose. He was an extremely popular Prime Minister. However, when an attempt was made to intimidate him and subject him to manipulative pressures, he preferred to step down rather than compromise his principles and self-respect. He resigned in March 1991 and was asked by the President to function as a care-taker government till the tenth Lok Sabha elections. He demitted office on June 20, 1990. He was then re-elected to the Lok Sabha from the Ballia constituency. Chandra Shekhar always remained engaged in intense political work by training social and political workers for mass education and for undertaking grass root work in the backward pockets of the country.